There is this beautiful bird call and I wonder if anyone knows what it is. It is not necessarily that bird pictured above! 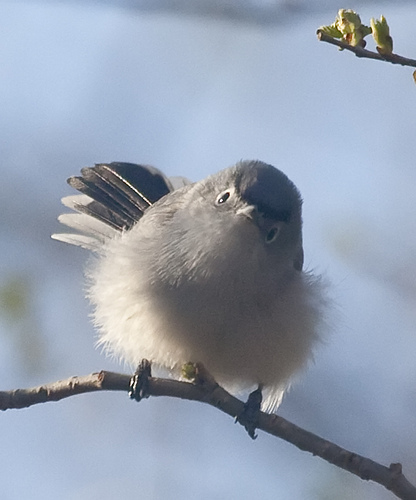 That is a Blue-Grey Gnatcatcher and I chose the picture because I like its look, not to mention its name. The bird I hear is three quick whistles followed by a trill followed by three more notes, two going up, then one going down. Remember the chickadee? I was able to figure that out thanks to wise people out there in the stratosphere. Birds are just something I am not good at. I know the robin because it is the first bird you hear in the morning. I have learned the cardinal, I think. But even now, it is something like 6:30 a.m. and there are all these birds singing at me and I do not think I know one of them! However my quest to ID this bird has led me to these fascinating sites. There is this one where you attempt, fruitlessly in my case, to try to identify the bird step by step. And Bird Jam where I am sure I have listened to about every single bird. I went down City Birds and then Warblers and Forest Birds. My bird is not among them! I am wondering if it is a kind of sparrow. My friend Melinda suggests an Oriole. I like to capitalize Oriole so it looks like Oreo. Now I have to go back to listening to Leonard Pennario. And so, suggestions are welcome!